Last year, BTN editor-in-chief Malcolm Ginsberg and his wife took a cruise on NCL Jade to southern Norway from Southampton and thoroughly enjoyed the experience. In 2018, CMV was returning with Marco Polo to northern Norway plus Murmansk and Archangel in Russia and it seemed a good idea to book early. Only six cruise ships visited Murmansk in 2017. The trip would be ‘educational’, attracting a mature audience. Tilbury is an easy port to use from London. When starting out from Southampton, it adds a half-day sailing in each direction when making for the North Sea. See also Part Two in October and the SEPTEMBER CRUISE ISSUE. 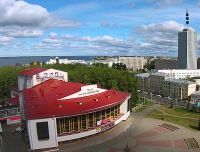 Murmansk is one of the world’s most northerly cities and the Russians do not make it easy for casual visitors, with either an expensive and cumbersome route to obtain a visa, or via a ship’s group tour package. The arrangements for the 2018 World Cup could easily be extended. All that was needed was a match ticket as proof of being a tourist. In 2016, prime minister Dmitry Medvedev signed a degree allowing for 72hr non-visa visits, but either it has been ignored or lost in Russian bureaucracy. Asked by state TV for my views on arrival at Murmansk, I made it clear if the city was to attract cruise ships, it needed to be more open for passengers. Marco Polo is not returning to Murmansk in 2019, one of the reasons cited being the hassle of paperwork involved. She was well over 1hr in leaving, due only to completing formalities. First port of call from Tilbury was Kirkwall following a sea day. Orkney is officially in Scotland although it likes to think of itself as somewhat independent. Its MP in Westminster is a Liberal Democrat. BTN has been before (BTN 1 August 2016). There is a population of 21,000 and 30 islands, with the capital, Kirkwall, on the oddly-named Mainland. The islands are self-supporting in terms of agriculture, have always been involved in fishing and are a centre for the offshore energy exploration industry. Figures just announced show a tidal turbine off the coast has produced more renewable energy in a year than Scotland’s total wave and tidal sector has created up to this point of time, enough power to support 830 householders. “Scotland’s remarkable marine energy resource has placed us front and centre in developing this industry with global potential,” said Hannah Smith, senior policy manager at trade body Scottish Renewables. Some 144 cruise ships will have visited Kirkwall this year, making it Britain’s second-busiest cruise port after Southampton. The visitors range in size from Hebridean Princess, with just 50 guests, to MSC Meraviglia, with 5,000 passengers plus 2,000 crew. Fortunately, not all disembarked. The out-of-town pier can take the largest ships but often, with two or three arriving on a single day, tenders have to be used and 10,000 people can descend on the little town. It’s a great boost to the economy and for the most part locals welcome the visitors. Marco Polo docked at the wharf and it was a 5min courtesy coach ride into the pretty town, with passengers deposited at a very comprehensive and helpful visitor centre. Brand new, the Kirkwall Gin Distillery and Visitor Centre seemed a good starting point and we joined a small group on an interesting tour, finishing up with tasting samples of the product, having a glass of our preferred gin with the inevitable tonic water. Husband-and-wife team Stephen and Aly Kemp have just opened the working attraction producing Kirkjuvagr Orkney Gin, named in honour of the islands’ Norse heritage. Gin production is remarkably simple and less than two years after the project was started, export orders are being satisfied. It is a short walk up the main drag, Albert Street, if you want to visit St Magnus Cathedral, parts of which date from 1137. It represents three building styles from various eras: Romanesque, Transitional and Gothic. The building is not owned by the church, but the local council. Entry is free. Close by are the remarkable remains of the Earl’s Palace from the17th century including the tower, a difficult but worthwhile climb to the top. Take a taxi out to the east of Kirkwall, past the airport, to Tankerness, perhaps 15min on largely empty roads. In what was once a church, and complete with stained-glass window, the Kirk Gallery and Café somehow successfully combines jewellery designer Shelia Fleet’s latest creations with an eatery offering fresh local produce through breakfast, lunch and afternoon tea. HMS Hampshire sank off the coast of Orkney 100 years ago, carrying Lord Kitchener, he of the recruitment posters. Only 12 sailors survived. Kitchener was on the way to see the Tsar. History could have been different. Nearby is the Orkney Brewery and Visitor Centre, formerly a Victorian schoolhouse. The beers are hand-crafted and visitors can join a tour. If they are hungry, there is the Dark Island Hotpot or the usual Brewhouse Burger, a wholesome quarter-pounder. Also offered are local specialities such as Westray rollmop herring and Grimbister cheese with Dark Island chutney. The spectacular drive alone is worth the visit. If you are not on a cruise ship, Loganair operates from all the major Scottish airports, and there are ferry services from the Scottish mainland. Another sea day, and into Trondheim, the third largest city of Norway, with a municipal population of just under 200,000. It lies about one-third up Norway’s long North Atlantic coast. It is connected to Oslo by St Olav’s Way, a 400-mile road, and by rail and air. The city was established in the ninth century and was the capital of Norway until 1217. Once a shipbuilding centre, its heart is essentially an island bounded by the Nidelva River and a canal. Much of it is pedestrianised with shops, the municipal administration and the magnificent Gothic Nidoras Cathedral. There is a cruise terminal within walking distance of City Hall, but for Marco Polo our mooring was a basic berth, just about walkable into town but easier with the courtesy shuttle bus. To get the day started, and to try to take in the whole metropolis, we took the electric tram from St Olavs Gate to Liam, a 5.5-mile, 18min climb dating from 1904 with a museum halfway up. At the top are a park and lake to stroll to as you wait for your return. New and somewhat ancient trams run alternately every 10min. The spectacular view gives a wonderful panorama of Trondheim and its hilly surroundings. Next, a tour bus with the major stop Sverresborg, 70 acres of open-air museum and more than 80 historical buildings built around the ruins of King Sverre’s castle of the 12th century. It offers a representation of the wooden houses that have dominated the cityscape from the 18th century until today. For us, it was a rush and does include the Gram House, unique in being privately built in brick. Some of the buildings today are eating places or offer an opportunity for the purchase of genuine Norwegian mementoes. The tiny Stave church, wooden of course, dates from the 1170s. Known as the ‘Gateway to the Arctic’, Tromsø was for a short while the capital of Norway when the Germans attacked Oslo in April 1940. It is an island connected to the mainland by the spectacular Tromsø Bridge, which restricts large cruise ships from berthing downtown. For our visit, a courtesy bus was provided into the centre of the town, very quiet early on a Saturday morning. If you need to get around, a day pass on the local buses costs £10 (£5 for concessions), with many of the stops now showing electronic indicator boards so you know when the bus is likely to arrive. Our first visit of the day was to the Fjellheisen cable car, rising to 1,378ft above sea level. We took a bus to the lower station, appreciated the breathtaking views from the top and replenished ourselves at the restaurant at the summit before returning. It was then an easy walk to the Arctic Cathedral, consecrated in 1965, the outstanding concrete design said to resemble an iceberg, prominent from across the water when you are in Tromsø itself. The walk across the bridge back to the city is not as daunting as it seems and once across the sound the nearby Polar Museum, situated in the old Custom House, has a section on how aviation helped research in the 1920s and also features the explorer Fridtjof Nansen, the ship Fram and his epic journey across the ice from 1893-96. Amundsen, the hero of Norway who beat Scott to the South Pole, is also highlighted. Outside Tromsø, and ten minutes on the bus network, is the military museum, telling the history of the wartime resistance and of the final sinking of Germany’s last capital ship, the battleship Tirpitz at nearby Hakoya in1944 by Lancaster bombers of 617 Squadron, the Dam Busters. If you have time at the end of your visit, and just over a quarter mile from the ship’s berth is the 30-acre Arctic-Alpine Botanic Garden, the most northernmost in the world. Built on the side of a hill it features Arctic, Antarctic and Alpine plants from all continents and includes a series of small waterfalls and lakes. There is also a small café and it is a popular venue for weddings. The location, corresponding to the north coast of Alaska, invites thought of an extreme Arctic climate. However, a branch of the Gulf Stream sweeping up the coast of north Norway provides a moderating influence, and the climate of Tromsø is one of relatively mild winters. Snow, yes, in abundance, but it can get up to 80F in July. Entrance to the park, part of the local university, is free. 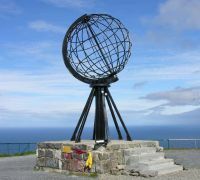 The North Cape (Nordkapp) is one of those places that needs to be visited “because it is there”. VIP visitors have included King Oscar of the then Norway and Sweden in 1873, symbolising the relationship of the two countries, who together with wife in Victorian crinolines, climbed up from sea level. The King of Siam visited the site with his retinue back in 1907. There is still much rapport between the present-day Thailand and the northern outpost, the Thai Pavilion opened by a member of the royal family in 1989. Nordkapp is on the island of Magerøya, connected to the mainland by a subsea tunnel. The European E69 highway has its northern terminus at North Cape, making it the northernmost point in Europe that can be accessed by car. Marco Polo berthed at the little town of Honningsvåg, which is also served twice daily by Hurtigruten, the Norwegian coastal operator, and besides acting as a supply service to the little villages along the coast markets itself as a low-key cruise company. When the Germans retreated in 1944 Honningsvåg, like many villages in the region, was burnt to the ground, only the church remaining. The 1hr run to Nordkapp takes you over some picturesque tundra moorland, frequented by reindeer, and by a native Sumi settlement. At this latitude, the sun shines continuously from 15 May until 31 July. However, the weather is notoriously unpredictable and rain, fog and cloud are all possible on a single day. For us, it was fine and not too breezy. The Cape itself sits 1,000ft above the sea, a large flat plateau where visitors, weather permitting, can watch the midnight sun and views of the Barents Sea to the north. The impressive North Cape Hall, a visitor centre, was built in 1988. It includes a café, restaurant, post office, souvenir shop, a small museum, and an underground complex complete with video cinema, chapel, Thai museum and a new attraction, the Cave of Lights, a journey through the seasons. Since the “Children of the World” monument was unveiled in 1989, the North Cape has been the setting for the Children of the World Prize, worth $50,000 last year. The winner is the organisation or project that works to improve the condition of life for children. The schedule took us past Murmansk and into the White Sea and our first port of call in Russia, Archangel. It is an enigma, discovered by Englishman Richard Chancellor, who was wrecked on the coast in 1553 when trying to find a north east passage to China. Making his way the 700 miles to Moscow, he persuaded the then-Tsar, Ivan the Terrible, to develop the port as Russia’s gateway to the west. In 1693, Peter the Great decreed shipyards be built, but soon after realised his mistake, with the city icebound for five months of the year. He founded what was to become St Petersburg in 1704 as a Baltic Sea, ice-free port and Archangel slowly died. The coming of the railways towards the end of the 19th century changed its fortunes to some extent and today modern icebreakers give all year-round access. It now has a population of around 350,000 but this is declining as the new generations find the long cold and dark winter a strain.There are better prospects in the south and the fishing industry is in a decline. The city has been pedestrianised in the centre, has a fine promenade, and is a mixture of grand Soviet buildings, dilapidated structures from the same era, and modern flats that would not be out of place in London. Visa formalities and disembarking was easy and our guide spoke perfect English, our compliments returned with the response that French was actually her second language. Everyone was very friendly, our lunch a fine two-course meal, at a resturant with a pleasant view overlooking the Dvina River. Credit cards were accepted for bar drinks and the courtesy wi-fi worked fine. Tourist shops are into plastic and euros, sterling and dollars are welcome. In a long daytime excursion, we managed three major visits plus a walk around the central area. There were a number of shopping malls, ideal for the winter, but a lack of Russian cars, most private vehicles being Japanese or Korean, with the occasional Range Rover. Built between 1668 and 1684, the Merchant Court sits on the river bank and is essentially a network of fortified depots and a trading centre. While only about one-third remains, it is still an impressive structure turned into a large museum covering the history of the whole region. In the 17th century, Archangel handled more than half the country's exports. Under the reign of President Putin, the Russian Orthodox church has made a strong comeback from its minor league status under Communism. In both Archangel and Murmansk, a number of new and impressive churches have been built in the last decade. Perhaps one of the most impressive visits on the whole trip was the tour of a 140-acre open-air museum called Malye Korely in a picturesque forest setting overlooking the city. We were welcomed by a specialist guide offering traditional bread, not unlike challah and salt. Founded in 1964, Malye Korely features the wooden buildings that have been part of the Russian north since time immemorial. They have been collected from all over the region. No metal nails are used in the construction, only axes and simple tools. There are more than 80 exhibits. The collection includes a bell tower, windmill, churches, peasant houses and a much larger property, the home of a wealthy village leader. In 2011, Russia depicted the village on some of its stamps. The Marco Polo trip was for 17 nights and continued to Murmansk, Sortland (Norway) and Bergen, with another ON TOUR to follow.